I’ve never really gone through a leopard print phase, in previous seasons I’ve merely been a bystander, watching the cat – print phase come and go. But this year, thanks to a certain bag, I can’t stop thinking about it, and how I can sneak some into my wardrobe. The bag in question is the Kate Spade 2 Park Avenue Beau Bag (Centre, Above) so if I have any super generous readers who crave that feeling of satisfaction gained only from gifting luxury handbags, drop me a line and i’ll send you my address. Catty collections have spanned the catwalks over the last month, from Lanvin, Miu Miu, Christian Louboutin and Lanvin, and I can’t even mention the Celine bag because I might go into a lust-induced meltdown. 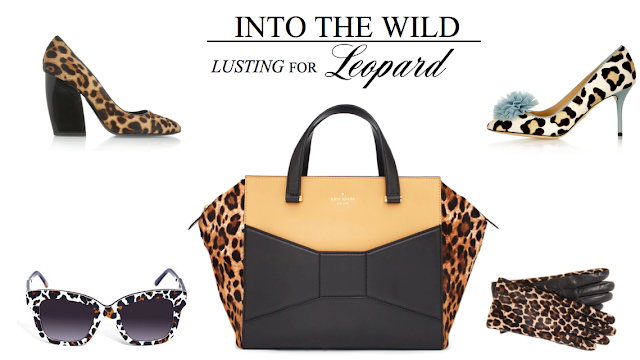 While head to two leopard may be a tad OTT, work it into your wardrobe via accessories such as a leopard handbag, or shoes. The Charlotte Olympia Pom Pom style heels are unapologetically feminine and will be the statement piece of any outfit, so dress down the rest of your look with neutrals and finish with a touch of leather to max out this seasons trends. Punctuate your office ensembles with the Pierre Hardy pumps – the chunky heel makes for easy strolling while the leopard reads easy glamour, so slip on with your blouse and pencil skirt. Agnelle’s leopard gloves are the perfect way to make a subtle statement as the days get colder but add elegant appeal when the sun shines with Stella McCartney’s shades. Have you invested in some leopard print in your wardrobe this season? Or perhaps you are a lifelong fan of the print; let me know how you’ll be wearing it this Winter!